Sky Blue Small Spider Lily Hair Clip 4.5"
Pink Small Vanda Orchid Hair Clip 4"
Purchased Item: Mauve Small Spider Lily Hair Clip 4.5"
This is a beautiful deep red spider lily. My second of two (the other is the blue one). 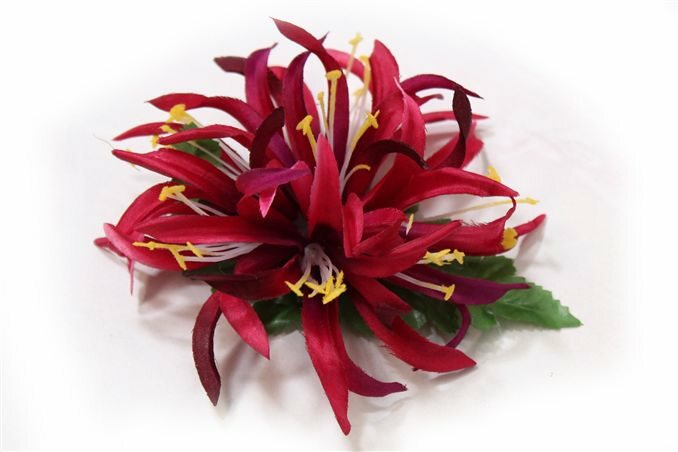 This is a deep red than the tuberose or plumeria flower clips. I LOVE IT! Beautiful piece, looks very realistic. bright colors, the clip holds well. This was a replacement for another similar hair clip i had, but gifted to a friend, so i bought myself another one.